Yes… huge links to assessment here. As Schimmer says, many of our kids have been on “losing streaks” for years… using sound formative assessment can work to change that. Thanks for commenting, Johnny! (and thanks for leading the change with assessment in high school settings). Thanks for the post Chris and framing this issue in a positive way. We often struggle with finding the reasons why students won’t try or attempt tasks- reiterating the need to meet students where they are and set the carrot a little out of reach….As a staff, we have begun to talk about “stamina” – focusing on supporting students to try and stick with it ( see stamina in the Daily 5 language program) especially when it comes to math. In short you made me think of the ideas that we learn through mistakes, ours is not to fly the students to the top of the mountain, but give them the equipment to get there and cheer lead all the way. One of the teachers at our school has taught me a lot about stamina with her grade 1 students and Daily 5. If we view everything through the lens of a skill and something that can be learned, we stop trying to motivate with external carrots and move to ones that come from within. Thanks, Ken – great addition to the conversation. Nice post, Chris. I like how you lead us away from the “competition vs no competition” conversation. 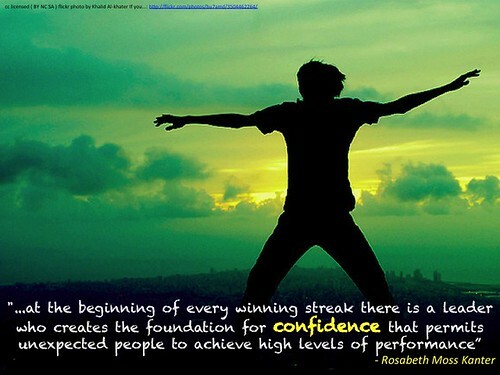 Rightly, our attention should focus on developing confidence and resiliency. We can do this when as coaches, teachers, and parents, we provide feedback about the process. Often it seems that too much emphasis is placed on the results (wins and losses, scores, etc), which has limited value in terms of feedback for learning and may be de-motivating (especially for those who had not chosen or were not ready to compete in the first place). When coaching emphasizes the process over results we are in a stronger position to support the learner. Focus less on judging, and focus more on giving feedback that builds confidence and resilience. Great post. developing growth mindset is a journey for us all. Sure is… and it is so important to teach this with young kids. I need to look more into elementary resources in this area. Hey Chris. Great post. I like the idea of the “bounce back” as well. I like to refer to it as dealing with adversity and the development of character, and your insertion of “grit” is perfect here. All of these things support my thoughts that we are coaches in the classroom, as those of us that do coach support these ideas with our teams every practice and game. I have also shared many of yours and others ideas around awards and there is some discussion here about that. Keep up the good work! Hey buddy – yes, I think people are sick of me using the coaching analogy but I love it (as long as we keep the focus on skill development rather than winning… because as we know, especially with younger kids, you can win but it does not mean the kids have learned the skills – ex. in volleyball, just keep giving the team the other ball until they mess it up). Awards is always an interesting topic… I think we are at least starting to question their use and to look deeper when we discuss competition and motivation. Thanks for emphasizing the coaching aspect – well needed here. I think the same intention is there (resiliency, bouncing back, confidence) in those who want to ‘teach kids to lose’ or ‘be good losers’. It’s just semantics? Hey Anna! I think there is a real push (or resistance to those who want to change) for schools to create opportunities to for students to continually lose as this is what the “big, bad real world” is all about. What I mean by this is that when we talk about more collaboration and less competition, we often get cut off and people immediately respond that “this is not the real world… kids need to learn how to lose”. When we talk about creating more success for students by meeting where they are, we get the same response. When we talk about moving away from awards and shifting to a system that honours each child for a strength they have… we get the “real world losing” comments and fail to move in to discussing learning resilience and building confidence. It is often surface level conversations (often in the media) that hinder deeper conversation. Yes, it is so important to experience falls, mistakes, errors, failures… but experiencing these in a game you don’t want to play against opponents in which you have no chance does nothing but disengage. I find the same frustration when we discuss moving away from grades. People hear this and think that we are all worried about self-esteem and we don’t get to move deeper into dialogue around real assessment. So semantics might be a part… but the conversation often ends with “competition good vs competition bad” when it is so much deeper than that. I agree with some of the earlier comments. The argument is not whether competition is good or bad (it is both, depending) but whether or not it promotes learning. Sometimes when I ‘win’ I don’t learn anything and sometimes when I ‘lose’ I don’t learn anything. Neither is really helpful. I terms of learning, that is one of the greatest strengths of formative assessment: it show students how to take the next step. As an English teacher, I have learned to use formative assessment only while teaching the skill and then introducing summative assessment when I’m grading a ‘finished’ product. I have seen students make much faster progress that way (once they get used to it). However, you also made the comment that ‘kids lose every day.’ I think that is where the comment that we should teach children to be better losers comes into play. We know they lose in many areas. You mentioned lack of parents, lack of caring parents, lack of food, etc. Teaching children to deal with that helps them focus on resiliency, develops grit, and interdependence. I guess where I take this is that we help children to learn that when they lose (and they will) that they do so graciously but with a determination that the end result will change. This holds just as true for when they compete against themselves or against another sports team or when it is against life (dealing with absent parents). Love what you said about competition, learning and assessment… some golden quotes in there. I think it is one thing to help kids with adversity and determination. It is another thing to purposefully turn school into a game in which certain students continue to lose each year. I know that is not what you are saying but it just came to mind with your comment. That is my real issue… often the kids who we teach to be better “losers” are the ones who lose on a regular basis… and could use the odd win once in a while to build confidence. Thanks for linking my post, Chris. I really appreciate the depth you have added to this topic in your post. Such good dialogue and thoughts added as well! It seems there is a lot to clarify what we mean by “losing”. eg How does “choice” fit in/impact… is losing the same as dealing with adversity? It may just mean that we have to really look at each individual’s circumstance…where they are, who they are, and where they have been. As you referred to as well. Yes – it is a very personal form of learning… as what is perceived as a “loss” to one may not be to others and the size of the loss may be much bigger to some. I guess what I am frustrated about is that when we hear that “kids need to learn how to lose”, the examples that are used often result in the same kids losing over and over again… and to me, that just widens the gap. Thanks for starting this conversation, Sheila. Chris, great post. As a former coach now Principal, the idea that has been permeated throughout society that you have to be successful at everything all the time is detrimental to our kids. It is OK not to achieve EVERY time. The key question is, “what do you do next?”. Do you just give up, or do you refocus, analyze what happened and learn form the experience. If our kids (and us) did that, then the experience was not a “failure”. Thanks for the article. I am going to share it with my staff next week. Thank, David – yes, the “where to next?” question is huge. It reframes a failure, loss, bump, glitch, fall… into a learning experience. A few years ago someone asked a student what was the most important thing they learned in my class. He answered, “Mr. Cote taught me it was okay to fail.” Thank god he explained that one because at the time there was not a growing support for this ‘old school’ approach to learning. Failure or ‘losing’ is such an important part of learning because it should always create the question ‘why’ and all learning starts with the question ‘why’.